Welcome to our blog stop tour for BEWARE THAT GIRL for Teresa Toten. This blog tour is hosted by Random House Children's Books. 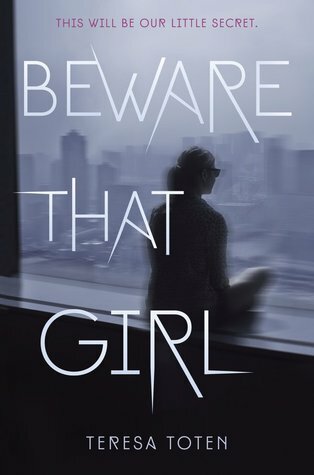 Beware That Girl is my 11th book and it is very, very different from anything I’ve written before. Apparently I like to take risks and live in a state of high anxiety because no matter how complex the story line is, I don’t plot or outline any of my novels. It’s a blank page with a blinking curser that greets me every morning and I have no idea what I’m going to write until I write it. I’m completely dependent on my characters doing the heavy lifting and pushing their own plot. I usually have an opening scene that’s been rattling in my head for a couple of years (like the hospital scene in Beware That Girl) and then I discover what the story is page by page. Without spoilers, were there any scenes you had to cut that you wished you could have kept? Ha! Unlike like all of my writer friends and all the writers I admire—If I could, I’d write a novel in point form! Almost twenty years later, the most consistent editorial comments I get are some variation of: “Teresa, you’re going to have to flesh this out more.” I would LOVE to have enough material to cut, hone and mourn when it had to go. It’s a tie. For my last book The Unlikely Hero of Room 13b I spoke to and sat in quite few different group therapy sessions for anxiety and Obsessive Compulsive Disorders. The young people I met in those sessions will stay with me forever. For Beware That Girl in my hunt for the perfect Upper East Side penthouse for my character Olivia to live in, I spoke to about half a dozen pretty fabulous doormen. Now I’m sure that with the tenants and anyone who goes into their buildings they’re the souls of discretion. But for a YA writer –WOW- did they have stories!! Those stories are going to live in me forever too. What's your ideal environment for writing? Since I don’t outline etc. my first draft is a messy, slow and torturous thing. It has to be at home in my little study on the second floor. Alone. I wander all around the house trying potential dialogue out loud and reciting narrative bits with the dog at my heels. I spend almost as much time wandering and reciting as I do writing so a laptop on the plane is just not possible for me. Do you have any exciting upcoming projects you can tell us about? I’m in that messy, slow tortuous part with my next novel. So far, it too is coming out pretty dark, a little twisted and kind of disturbing. To which Hogwarts House do you belong? Hmmmn . . .you know, I always pegged myself as a Ravenclaw kind of girl, but given what I’ve been writing the past few years, I’m wondering if I’m not Slytherin after all . .